Trailhead and parking area are on Sawyer River Road in Livermore, NH. Sawyer River Road is off Rt. 302 in Harts Location, 10.1 miles west of Rt. 16 and 19.0 miles south of Rt. 3. The large parking area is 2.0 miles down this dirt road on the left, just after a bridge. Mt. Carrigain stands at the geographical center of the White Mountains, giving it a perspective of the mountain ranges like no other. 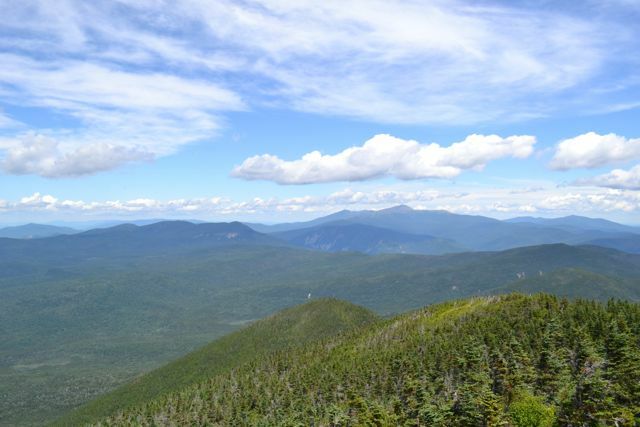 Many would debate that its observation tower has the finest view in all of New Hampshire. The price to pay for this extraordinary beauty is an unexciting eleven mile hike with a relentless, rocky three mile climb. The Signal Ridge Trail starts along Whiteface Brook. For about a mile, the trail follows easy grades along this brook. There are several nice cascades along the way. When the trail leaves the brook, there is another mile of flat terrain ahead. 0.6 miles after leaving the brook, the trail crosses an old logging road. In another 0.3 miles, near the end of the easy part of the hike, the trail crosses Carrigain Brook, a potentially difficult crossing. On the other side, the trail leads past a swamp and to a trail junction. Bear left to stay on Signal Ridge Trail as Carrigain Notch Trail goes right. From the junction, the trail continues flat for a short distance as it leads around a swamp, then it ascends a small hill with switchbacks and leads back down on the other side. A bridge over a stream feeding the swamp marks the end of the pleasant walk through the woods. From here, the trail begins the difficult ascent. It turns directly uphill, climbing at a very steep grade. It continues steeply for 0.8 miles, with a few switchbacks, before the trail turns right to angle up the side of Signal Ridge on a very rocky path. At this point, you can look back for a slight glimpse toward the cliffs of Mt. Lowell. The grade eases much here, but the loose rocks keep the hike strenuous. The trail stays on this for one mile, passing a few springs and a small viewpoint, before taking a sharp left turn off. Now the trail climbs by constant switchbacks for another 0.7 miles. After finally attaining the ridge top, the trail straightens out and climbs to the highpoint of Signal Ridge, where there are majestic views to the east and west. Directly in front of you is the summit of Carrigain, with its observation tower clearly visible. After the trail dips back into the woods, the summit is another steep half mile away. On the summit, there are limited directional views to the east and west, but the tower must be climbed to see in all directions. From the tower, the views are absolutely breathtaking. The great expanse of the Pemigewasset Wilderness stretches out before you, with all of its mountain ranges prominently displayed. To the northeast is the Presidential Range, with the striking Webster Cliffs seen over Crawford Notch. The Sandwich Range is seen to the south, from pointed Mt. Chocorua to the Tripyramids in Waterville Valley. Further over are the Osceolas and nearby Hancocks. Overall, forty-three of the other forty-seven 4000-footers are visible, a summit view distinction held only by Carrigain and Washington.